In the world of adventure sports photography being in the right location isn't always enough. Often times you have to match the athleticism of the athletes you are photographing to get those really amazing shots. that means hanging off the side of a cliff hundreds of feet above the ground alongside a rock climber. Or swimming a couple feet above a coral reef in twenty-foot plus surf. In this case, it means spending a week in the desert running up and down sand dunes. 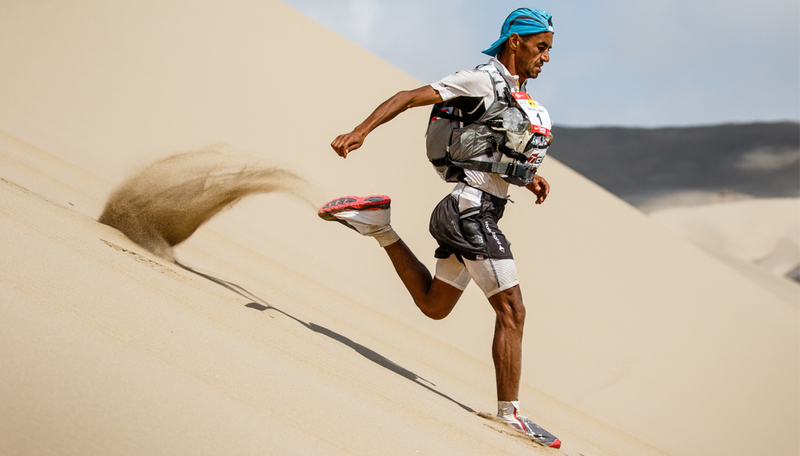 Both the original Marathon des Sables in Morocco and its new sister event in Peru are what are called Ultra Running races. These are extreme marathon races that push the abilities and endurance of runners to their absolute limits. This winter marked the first edition for the South American version and, like its namesake, the Marathon des Sables Peru was just as grueling of an adventure. Three hundred runners race across 250km of dry arid desert and huge sand dunes between the Pacific Ocean and Andes Mountains. Divided up into 6 stages spread across 7 days, the runners must carry everything they will need for the duration with them, except for water and a tent. Obviously in a race where endurance and speed matter, limiting as much carrying weight as possible is very important. Do you carry less food and clothing or skimp on the comforts of a sleeping bag and pad?